The Portrait PSR system is the flagship products of Rhytec, Inc. Portrait PSR treatments are appropriate for both epidermal to deeper dermal conditions. The Portrait® has proven to not only deliver outstanding therapeutic results, but also to minimize the duration and discomfort of the recovery period. All of your patients would choose comfort and quick recovery if offered the opportunity. 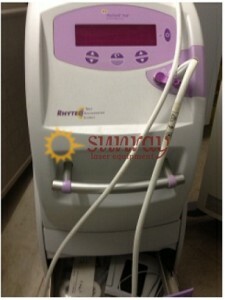 Unlike most of our cosmetic medical devices, a refurbished Rhytec Portrait is not a laser. Rather, the Portrait is a unique approach to genuine, lasting skin regeneration. The used Rhytec system relies upon gaseous diatomic molecular nitrogen, rather than light beams or invasive surgical procedures. Portrait delivers nitrogen plasma directly to the architecture of the skin without actual skin contact, and reaches deeper layers of the dermis by thermal conduction. Nitrogen plasma treatment has proven its utility across a wide range of skin types and conditions. If you chose to purchase a used Rhytec Portrait device from SunrayLaser.com you will quickly notice the ease with which the system can be moved to any location in your office and shared among multiple practitioners. Nitrogen plasma treatments remain a popular alternative to conventional laser treatments. To get the internet’s best price quote on a quality used Rhytec Portrait PSR, enter your contact information in the form below. One of our trained specialists will contact you quickly. We are always happy to discuss your needs as well as how a Rhytec device might enhance your practice.